Note: This article was originally published in The Winston-Salem Journal. If Hollywood trends are any indication, fairy tales are back in style. "Grimm" and "Once Upon a Time" remain popular television series, there were two film adaptations of "Snow White" in 2012, and this year has already seen the release of tentpole movies based on "Hansel and Gretel" and "Jack and The Beanstalk." But despite studios’ best attempts to reinvent commonly known characters and tropes into something fresh, the most original fairy tale reboot of all might not receive a wide theatrical release in the United States. "Blancanieves," yet another adaptation of the Snow White tale, is one of two films, along with "Casting By," that will open the 2013 RiverRun International Film Festival on Friday. 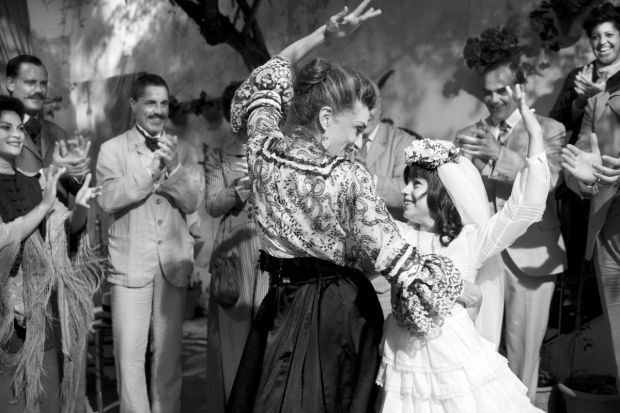 This isn’t your typical fantasy film: It’s Snow White mixed with "The Artist" by way of 1920s Spain, a silent black-and-white period piece in which the heroine is a matador with a troupe of bullfighting dwarves. Andrew Rodgers, the executive director of RiverRun, said that programming "Blancanieves" as an opening night attraction was a "no-brainer." It’s the type of high-energy, infectious film that he hopes will excite audiences and motivate them to check out more during the 10-day festival. "It just struck every chord," Rodgers said. "Yes, you’re watching a Snow White tale, but it feels like a wholly completely original thing in and of itself." "Blancanieves" is the second feature film from director Pablo Berger. His first film, "Torremolinos 73," received positive reviews upon its release in 2003. Despite the acclaim, it took nearly a decade for his next project to come to fruition. "Door after door was closed," Berger said. "All the producers in Spain said, ‘You made a hit and now you’re going to make a black-and-white silent film?’ I finally found a producer who wanted to make it, but it still took eight years to get off the ground." Berger read the original "Snow White" story by the Brothers Grimm and tried to see every film adaptation, including a black-and-white silent version from 1916, so that he could be sure to take a different approach. The inspiration for his version came from a book of photographs by Cristina García Rodero called "España Oculta" (Hidden Spain), which included a picture of a group of dwarf matadors. "In my head, I just put Snow White in the middle," Berger said. "I already wanted to make a black-and-white silent film, and when I saw that photograph that was the beginning of everything." The film is steeped in traditional Spanish culture, from bullfighting to the dominant presence of religion in citizens’ lives. The titular character is presented as a virginal, saintly figure, while her stepmother takes on characteristics of a demonic temptress. "I kept the key elements of the story, but I wanted to try and go a different way," Berger said. "I’ve always been fascinated by the iconography of Catholicism. It helped me create images that are really far from the familiar Snow White story." The film was Spain’s submission to this year’s Academy Awards, and it won 10 Goya Awards, including Best Film. Acclaimed Spanish actress Maribel Verdú won the Goya Award for Best Actress for her portrayal of Snow White’s evil stepmother. Rodgers said he’s not worried about the possibility that the fact it’s silent and black-and-white might alienate some viewers. He cites the 2010 closing night Russian film "Hipsters" as an example of an international film unfamiliar to mainstream audiences that attracted large crowds. "There may be people who don’t want to see ‘Blancanieves’ for those reasons, but I hope they’ll take a risk on this one because I think they’ll be incredibly rewarded," Rodgers said. "It really is a special film."